Have a look at the latest offering on Alison Clarke's blog. I agree wholeheartedly! This week sees the start of my full time private practice - The Reading Clinic. Offering literacy tutoring using the Sounds Write Phonics Program, Functional Literacy Assessments, Parent Support and School Support. My aim is to do my bit in making literacy accessible to all, increasing understanding by all of literacy difficulties and what can be done. In the weeks to come a teacher colleague and myself will be putting together information sessions for parents of children with literacy learning difficulties to help them understand their child's difficulties, what can reasonably be done in schools and what they can do to help. We will begin our work in regional centres. And I know from experience that often psychologist's reports are not well understood by staff in schools. 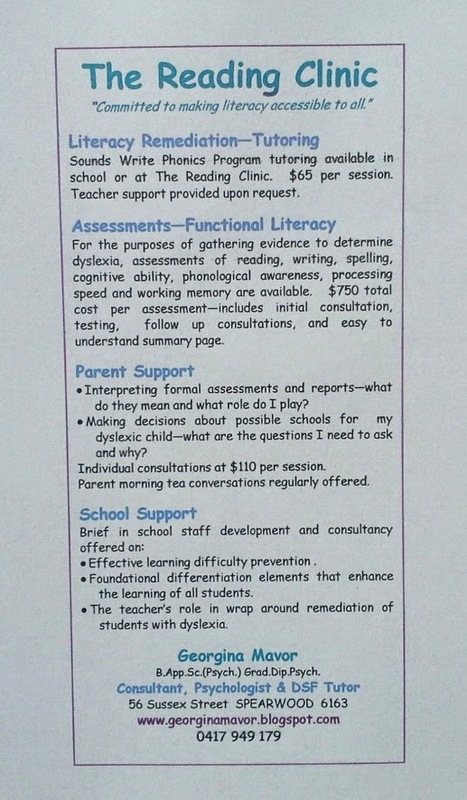 I was confronted with questions about specialist skills required by staff to work with kids with dyslexia. Again, we will develop information sessions for staff. Remediation for these kids is not rocket science, it is simply good teaching. Early language immersion has huge implications. In concrete terms it translates in to how many words a child has been exposed to - differences in the millions. Classroom teachers do not facilitate learning with 30 odd children who have all been exposed to the same number of words. The difference in exposure to words means children in a single class vary a lot in terms of their familiarity with words that are used in classroom lessons, how easily they 'click in' to the sounds of words and who can access and work with a broad range of words. And it further plays out in who can develop their recognition of familiar words into more meaningful recall of words from long term memory. It affects comprehension of what they write, richness of what they write, their ability to use their working memory potential well. Ruth Miskin goes on to list a number of very good questions for school leaders. Any parent with a child struggling with literacy would be wise to note these questions and ask them of the schools they are considering. Pulling all of this together is not easy for schools .... or for parents. Literacy development for many children requires intensive and extended effort. As a parent I know I fail, often, to maintain the level of home input that is really required to 'quicken' the pace of my daughter's remediation. I know from experience how an overemphasis on developing literacy can undermine relationships and balance within a family home. So I do what I can and I look for ways that I can retain and enrich my daughter's relationship with words and reading even though it may not be easy for her. I support the explicit phonics instruction of her classroom with nightly reading of books (at level - decodable). I look for ways to extend conversation. We talk about words. I look for ways to keep stories alive and interesting. And I look for ways in which I can keep her engaged with writing (journalling and creative) and the magic that brings. For many children struggling with literacy their relationship to words is severely contaminated. I'd like to think we can reengage them. Success is the biggest motivator which is why I believe wholeheartedly in good solid explicit tutoring. Children should be able to trust someone to help them learn. And I want to keep children open to the magic and character strengthening of stories, and books, and writing. This week I noticed two workshops for children being conducted through the Fremantle Arts Centre Arts Courses. I've enrolled my daughter in one of them - 'The Laboratory of Hairy Words' for 9 - 12 yr olds. 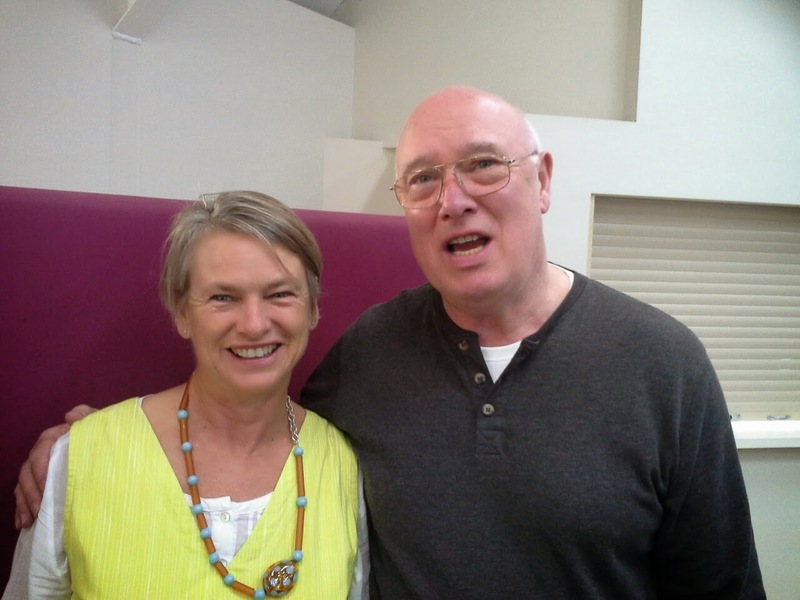 Its a new course, facilitated by Josephine Wilson. Children get to play with words in the creation of a small work of fiction. I am hoping this is fun, great fun, and that my daughter comes home full of enthusiasm for playing more with words. She has already mastered the skills of making her own books. The ones below were made in the days when I operated The Paper Muse. We have had many an enjoyable moment using the suggestions from this little book "How to Make a Journal of Your Life" by Dan Price in filling our journals with drawings and photos and things to stick in. Now I'm hoping her time with Josephine and other children tickles along her confidence and enjoyment in crafting her own stories and putting them to paper. The Laboratory of Hairy Words is a new course. I hope it is a huge success. If my girl comes home talking enthusiastically about what she has done then we've made inroads on two levels - more talking and conversation, and more writing. I will keep you posted. This past week, John Walker, UK founder of the Sounds-Write Phonics Program has been in Perth with Mary Gladstone (Sounds-Write Australia) running training groups as DSF South Perth and staff at a local school. Tutors and Teachers who were trained last year also had the opportunity to spend several hours with John and Mary, before both departed for their homes overseas and interstate. I was very fortunate to partake of this opportunity. Not only did I reap the rewards of John's and Mary's experience and expertise, I also benefitted from the experience and questions of my Sounds Write colleagues. Many thanks to DSF South Perth for the opportunity to spend time with all these amazing teachers. I picked up a few tips for working with students who have been so traumatised by their journey in trying to learn to read that they can barely participate. I learned that our brains are hardwired for recognising faces, learning language, picking up social practices, hunting and learning to recognize predators. All other learning builds on this primary hardwiring. The book 'Visible Learning and the Science of How We Learn' by John Hattie and Gregory Yates was mentioned more than once - I will post more on that in future blogs. Reference to this book reinforced what was presented in an educational psychology seminar I attended the previous evening - if we want children to be able to spell well they must have explicit instruction with a lot of repetition - at least 4 repetitions for each word if a representation of the word is to be retained in long term memory. The real work in teaching spelling is in the 'extended code' - understanding the sounds represented by more than one letter. 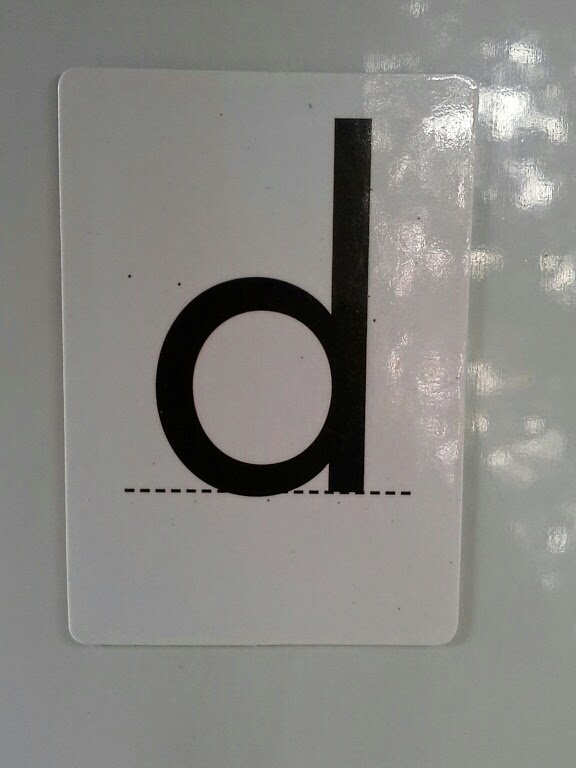 Many students have difficulty remembering the orientation of 'b' and 'd' when reading and writing. Students on the spectrum of dyslexia in particular find it difficult 'bedding down' the correct orientation for 'b' and 'd', 'p' and 'q', 'm' and 'w'. So the challenge is to find a strategy that enables them to quickly make the correct orientation and to practice it to the point of automaticity i.e. to build the neural pathway and to strengthen it to the degree that kids who are hard wired to see patterns and make connections, do with less effort and explicit instruction. Various approaches are used. At the very basic level all letters are made up of circles (whole or in part) and strokes. Sometimes teachers use the terms 'bats' and 'balls'. For the letter 'b' students are verbally instructed that the bat comes before the ball whilst for the letter 'd' the ball comes before the bat. But we know from brain research that visual presentation of material always wins out so using verbal language to create the correct neural pathway may not be the most effective. fingers. They then have 'b' and 'd' directly in front of them. If I link this movement to the word 'bed' then they have an easy and quick method of comparing their hands to letters in front of them to determine if the letter is a 'b' or 'd' and therefore if the sound to be spoke is a /b/ or /d/. 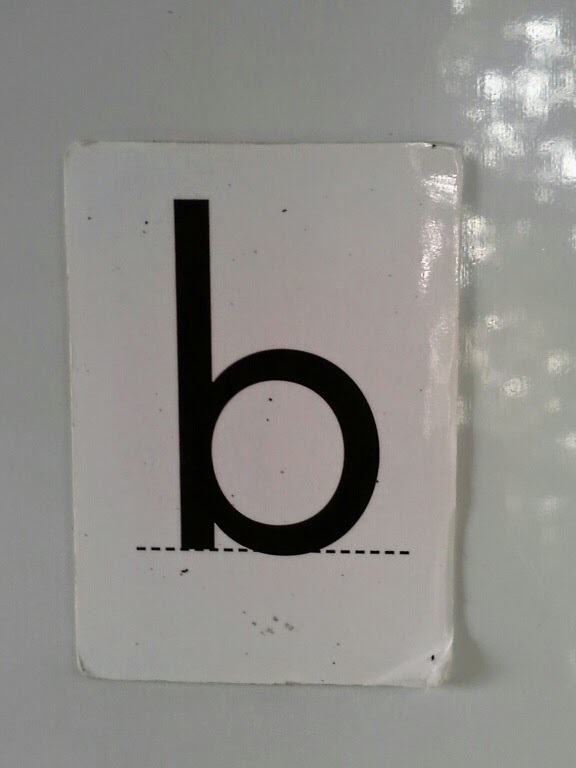 A couple of weeks ago a friend informed me that her son (with dyslexia) had worked out his own way of knowing how to differentiate between 'b' and 'd'. She then showed me that when we start to make the sound /b/ our lips are tight together and in a straight line, i.e. the 'bat' is first when we say /b/. Similarly when we start to make the sound /d/ our lips are round and open, i.e. the 'ball' comes first when we say /d/. Since then I have learned that this technique is promoted by reading therapists worldwide. But be prepared. Just because they have learned to use the hand or mouth technique to differentiate between /b/ and /d/, children will need to check using their technique every time they encounter the sound or letter. Otherwise they will continue to guess - incorrectly. I was going to say one of the reasons I got involved in understanding reading and how to teach it was because I wanted to be able to influence children's relationship to the written word and the joy that can come from it. Actually that wasn't the one big reason - THAT was watching my daughter struggle with no observable support from her classroom teacher at that time. Back THEN I thought that getting children to read was simply about finding the right program to teach them. 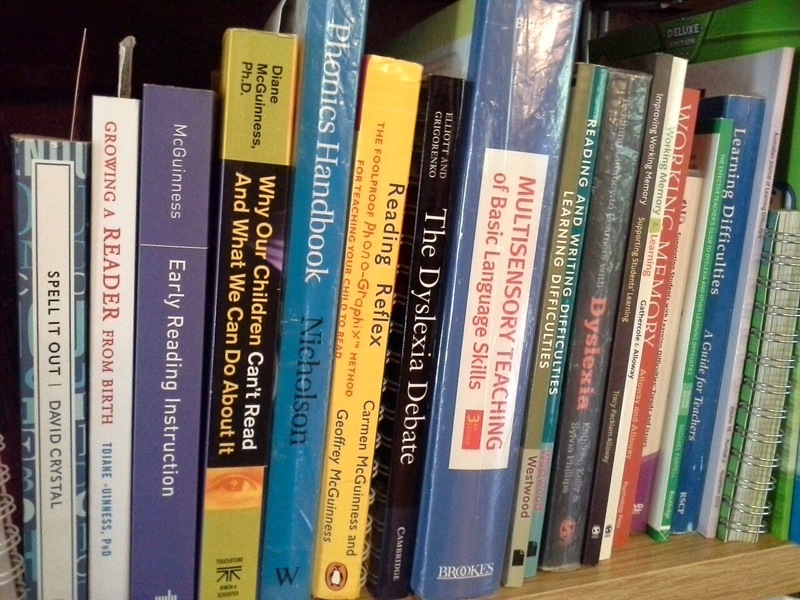 What I FINALLY realised was that yes, there is overwhelming evidence that a great phonics program really does make a huge difference, but what I saw at the level of one on one tutoring was that how I was in my being and how much enthusiasm I brought to the learning experience was of equal if perhaps not more, importance. I love books, I love to read ... and at my age I should probably be sitting around, enjoying the simple pleasure of reading, a lot. I am happy when I am reading and playing with words. So how do I bring this to my tutoring of young charges, who, more often than not, have been totally put off reading because they were either not taught correctly and/or just had too much difficulty with the task. I go back to being able to influence children's relationship to words on a page, the fabulous stories they convey, the pleasure of turning a page, the texture of paper, and the feelings of pride when we construct our own stories. I am a trained bookbinder. 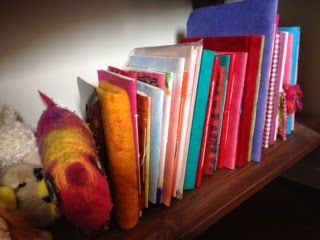 I have conducted many workshops with adults and children on making their own books. I have not yet progressed on to writing my own book, but who knows, maybe one day. 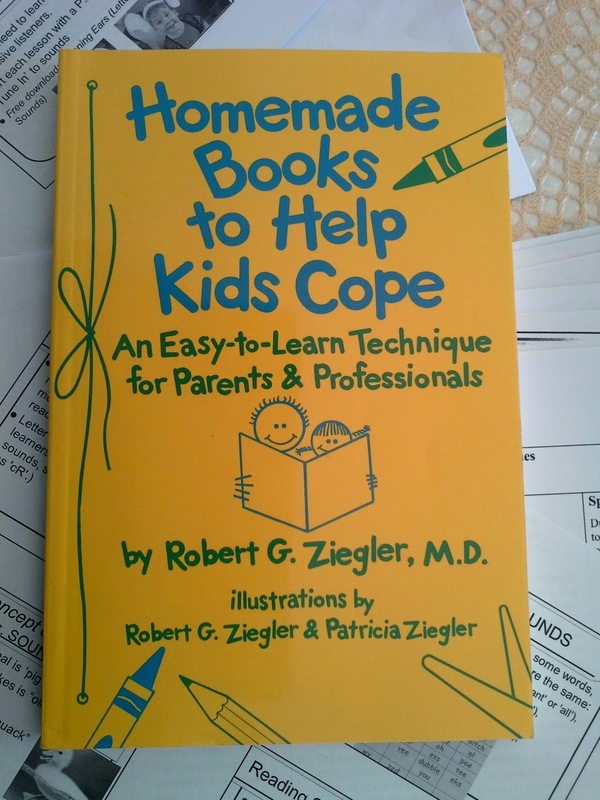 The book, 'Homemade Books to Help Kids Cope' by Robert G. Ziegler, M.D. is a book I hold as one of my most treasured. I love the idea of writing stories for children who need help with understanding. I love the idea of parents writing stories for their children and I love the idea of translating these stories into little homemade books if people want to take it one step further. If children have a negative relationship with words then my aim is to engage them through sensate rich creativity. Using the process outlined in this book, simple bookbinding skills and kids' interest in writing stories and adding their artwork, I aim to increase the power of the learning and change their experience to one of awesome enjoyment. 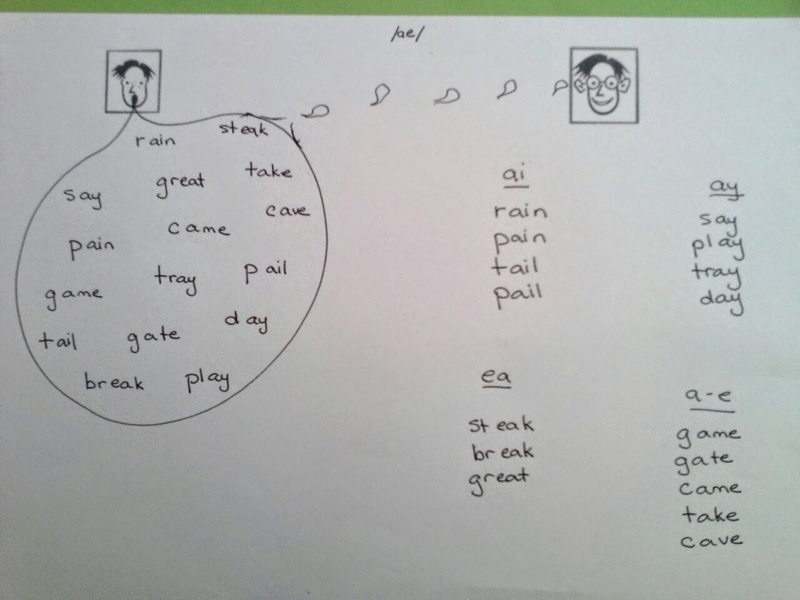 I start with a Sounds Write lesson in which children sort words of the same sound into different spellings. We know from our research that solid spelling skills required repeated exposure (and for many children, lots of repeated exposure!). We also know that the more senses we engage the more meaning is made of what is being learned and the more rich and solid the neural pathways that are constructed. In Sounds Write the sorting process is taught and can be followed up with worksheets. I have taken it one step further. Here I have taken the story writing template outlined in the book mentioned above and invite children to write a 'decodable' story using as many words with the target sound as possible. All other words may only be constructed from sounds they have covered. 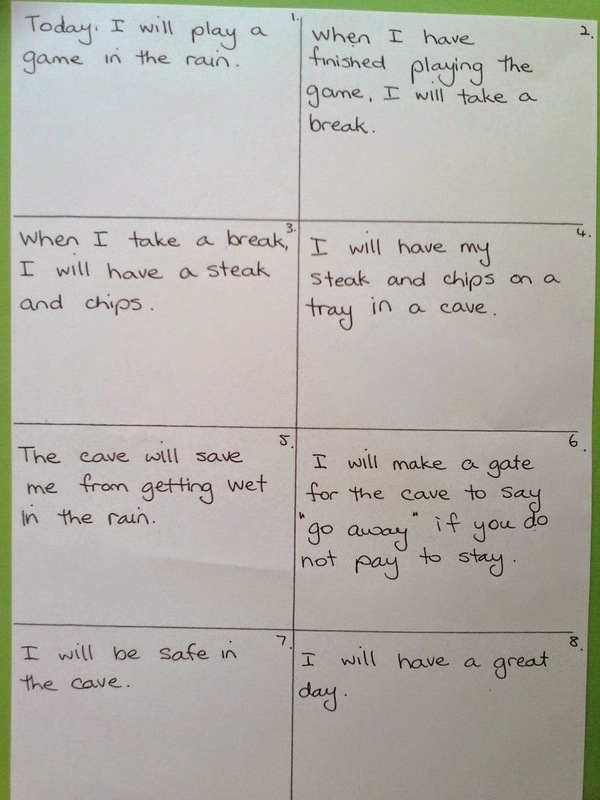 Any frequent words with irregular spellings will also need to have been covered in the Sounds Write Sequence and Scope. Its a challenge but not as difficult as it may seem. 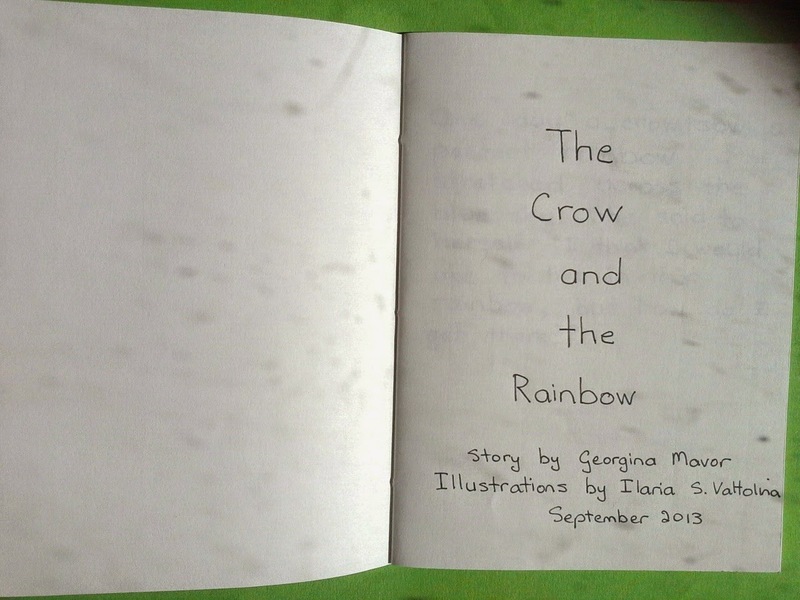 And if children are really motivated I invite them to add their own artwork or for those especially keen I am happy to bind up a simple book which they take away. As these stories and books are constructed I will post them on my blog. Here is one I constructed with daughter last year - only we haven't got around to adding the artwork! Published decodable books can be expensive to buy and come along with professional artwork. We all need resources to support our work using good phonics' programs. Older children can be put off with some of the 'younger looking' resources available to them. In addition to being more multisensory and then more potentially powerful, perhaps writing one's own story and illustrations is also more grown up.